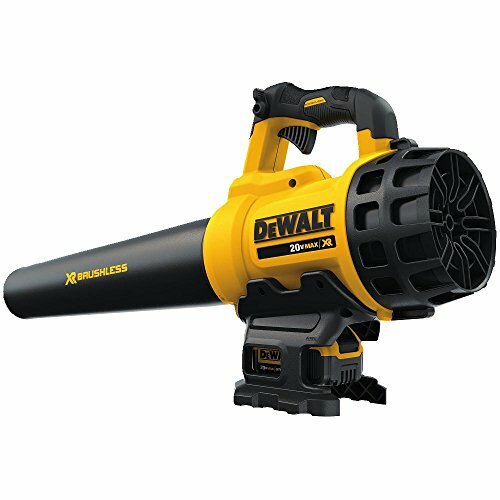 The market today is flooded with all kinds of leaf blowers, but there is nothing so handy as a battery powered cordless leaf blower. It’s perfect for gardeners, professional landscapers, and anyone who doesn’t want to be dealing with a tangled cord while they get the leaves cleaned dup. You can easily move across your entire property, no matter how far from the house you get. And you’d be surprised at how quiet, light, and easy to use a cordless leaf blower can be! 14 What Makes a Cordless Leaf Blower Worthy of Being the Best? 15 Should You Invest or Save Your Dollars? We’ve gathered up the best cordless leaf blowers on the market to help you find the ideal option for keeping your property pristine. Let’s take a quick look at each option. Here’s why we included these models on our list of the top cordless leaf blowers. 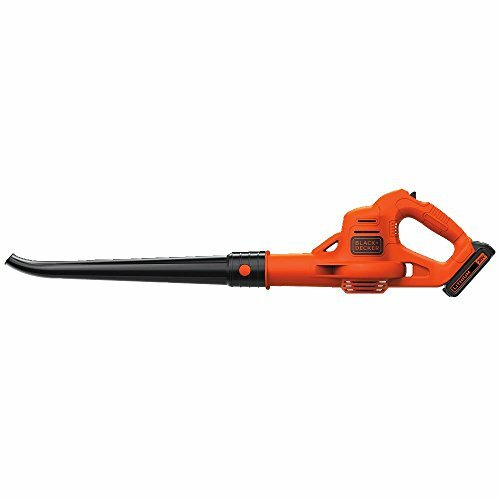 This cordless leaf blower is ideal if you have a large yard, or a lot of different areas where you need to blow away leaves. Workshops, the yard, the sidewalk, or any area where you need to clean up, this model will be your go-to. It works for both daily use and heavy-duty jobs, and weighs less than eight pounds, total. This is considered heavier for a leaf blower, but it makes up for it with quality components that offer great control. The battery offers between 20 and 40 minutes run time, depending on what setting you use, and this produces about 61dB of noise, which is pretty modest. You can change up the power usage with the trigger, lock the speed in place, and there is both a battery indicator and a charger so you have everything you need to get the job done. If this leaf blower has any downfalls, it’s mostly just in comfort. The handle doesn’t have any sort of padding to make it comfortable to hold. That’s really the only downside to this model. For the price, this is an exceptionally great versatile leaf blower. Sometimes the things we think of as leaf blowers are called sweepers, meaning they are better at blowing away debris like tiny gravel off your driveway. However, they can still be used to clear away leaves, and in the case of this model, they may be even better. This BLACK+DECKER model is very quiet, and extremely lightweight s well. It weighs only 3.7 pounds, so it’s perfect for carrying all around the yard without any fatigue. It also has a lithium-ion battery, but offers only up to 20 minutes of run time, max. 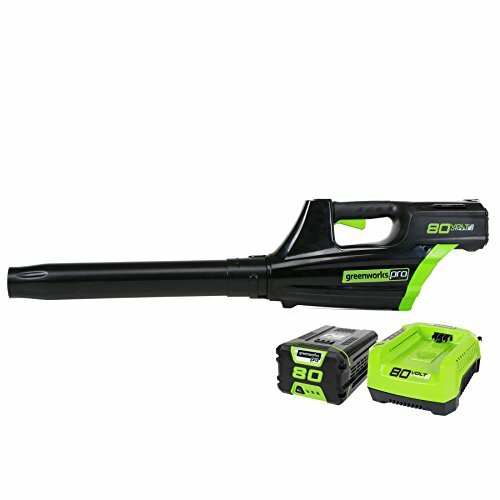 It can clear 100 cubic feet a minute, and creates a blast of 130-mph wind, so it’s got plenty of power for cleaning out the car, getting rid of leaves in flower beds, and keeping your driveway pristine. This is really best for someone that doesn’t have a lot of wet leaves all over the place, and just wants to keep their small yard looking great. 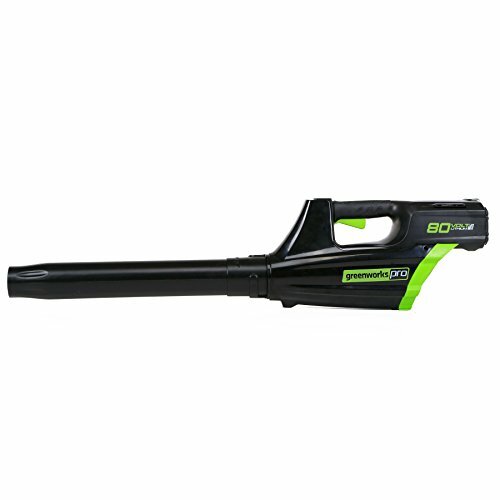 Need a cordless leaf blower that will work for longer than 20 minutes per charge? This one from Greenworks offers up to 45 minutes of run time, and takes just one to two hours to charge back up. It uses lithium-ion batteries as well, and maintains a lower weight at only 3.4 pounds. This one is great for simple cleanup, like getting your gutters clear of dry leaves, or keeping the deck cleaned off. It’s perfect for the homeowner that only does basic yard maintenance all at once, and doesn’t want to spend every evening blowing away every leaf that falls. 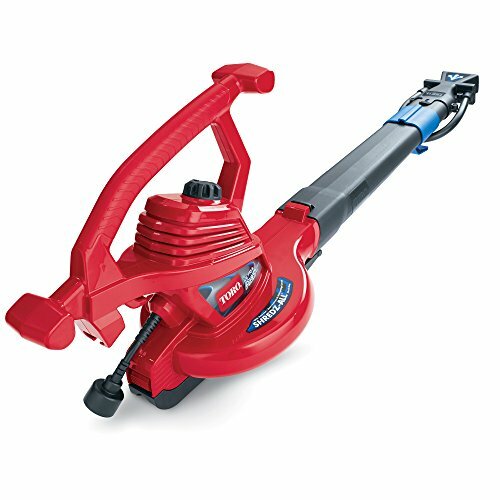 It has a variable speed trigger as well, and an ergonomic handle that works perfectly for keeping you comfortable while you use this blower. However, this does have a less optimal airflow than many other models, and the longer run time only works on a very slow speed. If you use this blower on higher speeds to get more power, you’re still looking at around 20 minutes of run time. Interested in a tool that does more than just remove leaves? This model has eight attachments that can do many other things. Or example, use the deflating attachment to deflate pool toys or air mattresses, use the dust brush to clean in nooks and crannies, or use the inflator nozzle to get the pool toys ready for the summer. This blower has about 20 minutes of run time on a single charge, and it takes about three hours to charge back up. This is a very compact, lightweight model that is great for using all around the yard, in the garage, and even in the house. It is fairly quiet as well. The only downside to this model is that it’s not heavy duty by any means. It is made for light yard work and versatile chores around your home. This is a brand new model from this brand, and they have made some changes to their old model. It now has less speed, but a lot more air volume thanks to a wider nozzle. It offers 120 miles per hour of air, still plenty of speed for basic yard work. One issue with this design is that it is noisier, creating as much as 96 dB(A). It weighs about 9.9 pounds, which is heavier than the other models on this list, but it offers about 50% longer battery run time per charge than other models – giving you about half an hour of run time at setting number three. It also has a rubberized soft grip to make the handle comfortable to use. Here’s one if you want lots of time to get your yard clean and tidy. It offers 70 minutes of work if you are fully charged, and has tons of power that allows you to blow away wet leaves. It is also a very quiet model, with only 60-decibel operation. However, be aware that the long run time is for a lower speed. If you run this model at the top level, it will only give you 20 minutes of run time. But no matter what speed you use, it charges back up in less than an hour. It weighs only 8.9 pounds, and includes special features like a turbo button for a blast of power, comfortable ergonomic grip, and a variable speed trigger. 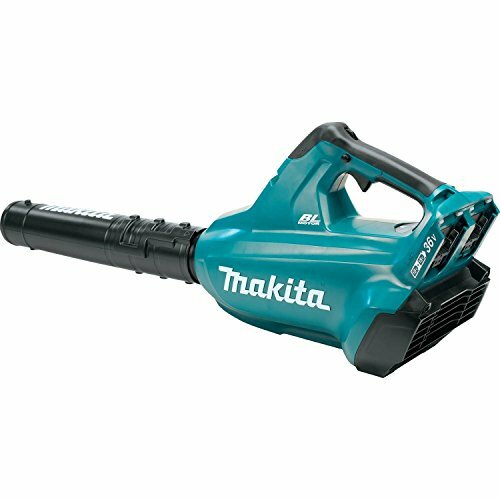 If you want a cordless leaf blower that is very comfortable, this is the model for you. It offers plenty of battery life, power, speed, and air volume, but the ergonomics of the handle are what set this apart. These are perfect for professionals or homeowners that spend a lot of time using their leaf blower, and need it to be comfortable. 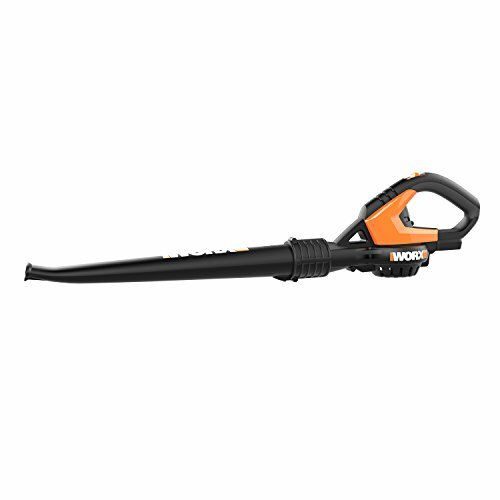 It is a forceful leaf blower with a hyper-stream air nozzle that handles wet leaves and other tough debris easily. The total weight is just under eight pounds. Two big drawbacks here are run time and noise. This is a loud machine, and it has one of the lowest run times of all the models we reviewed, coming in at just about 10 minutes if you use it on full speed. 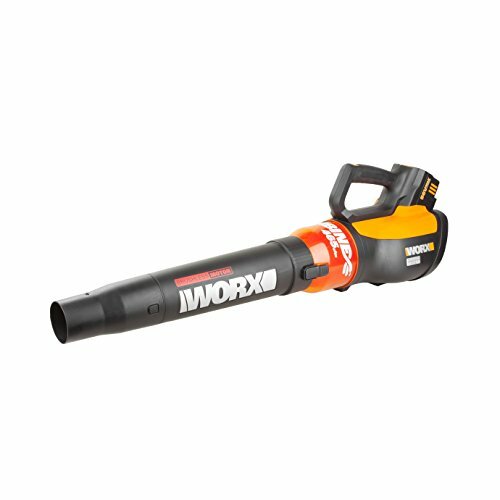 Here’s a great all-around cordless leaf blower if you want something with the most balance across all the features. It gives you nearly half an hour on a full charge, with 120mph blowing performance. It does have two interchangeable batteries included, and it works well for tasks like cleaning out gutters or removing light amounts of snow. This is a lightweight model and comes with a very decent three-year warranty. It’s not the best at clearing leaves out of grass, but for the price, this is a great all-around home model. This is a combination tool that offers several different attachments to handle a lot of jobs around the yard. You can blow leaves away, or vacuum them up into an attached collection bag. This blower weighs just under nine pounds, and is very well-balanced. You can use this one-handed no problem, and it has conveniently placed controls to make using it simple. It does have a variable speed control trigger that allows you to blow away wet leaves or other tough debris, and when you use this blower in vacuum mode, you are actually shredding the leaves to mulch as you collect them, which makes it easy to use or get rid of them later. This is another model that offers lots of run time, up to 70 minutes on a single charge. This one stands out, however, because it offers 70 minutes even when you are using this blower at the highest speed. This is primarily suited for professionals or hobbyist landscapers who need to clear large spaces often. It also takes only half an hour to charge back up – just enough time to take a short break and then get back to it. It’s a very quiet model, and has speeds of up to 125 miles per hour – the same as a tornado. In other words, you’ll have no problem getting this cordless blower to get rid of wet leaves or tough, matted-down debris. This is a very efficient leaf blower without being very powerful, meaning you’ll get a bit more run time and a very quiet motor. It has just 92-mph speeds, but the quietest noise rating of any blower that we reviewed. It also weighs just five pounds, and is very easy to use. Simple and efficient is the name of the game with this blower. The battery will give you a full hour of run time, although the battery isn’t known for lasting very long overall. It isn’t the most comfortable handle that we reviewed, but overall this is a good, basic leaf blower for someone that just wants to get the job done. What Makes a Cordless Leaf Blower Worthy of Being the Best? There are many parts of a leaf blower that must be considered when reviewing them. We looked at things such as battery-run time, how long each leaf blower takes to charge, any special features, warranty information, the price tag, how easy it is to use, how versatile it is, and if it has anything else that sets it apart. Warranties are a big part of choosing a great leaf blower. The warranty will ensure that your leaf blower choice is very reliable. For example, Dewalt cordless leaf blowers come with a three-year warranty that covers defects in the material or build of the leaf blower. This doesn’t cover wear and tear or accidents, just factory problems. However, some leaf blowers come with a warranty that replaces parts and even the leaf blower in total, for several years, if any part becomes defective. Another thing to consider is the balance between power and weight. The more powerful your cordless leaf blower is, the more it will blow away leaves faster and farther. However, this can make the machine a lot heavier to carry, because the motor must be larger to get more power. Another thing that can impact the weight of the machine is the battery. If you want a battery that will run all day without charging, you’ll need a bigger, heavier battery. Most cordless leaf blowers don’t have this kind of capacity. The top leaf blowers on the market inch towards about an hour of battery life, with most mid-range models coming in between 20 and 40 minutes. The most important feature that we look at when it comes to choosing a great leaf blower is how easy it is to use. A cordless leaf blower is often way easier to use because it allows you to move around more freely. However, even among this type of leaf blower, there are some things that can make them easier to use than others. For example, is the grip comfortable? Is the machine well-balanced? Is there a dial that lets you adjust the power in an instant to avoid raising up dust or hurting landscaping? 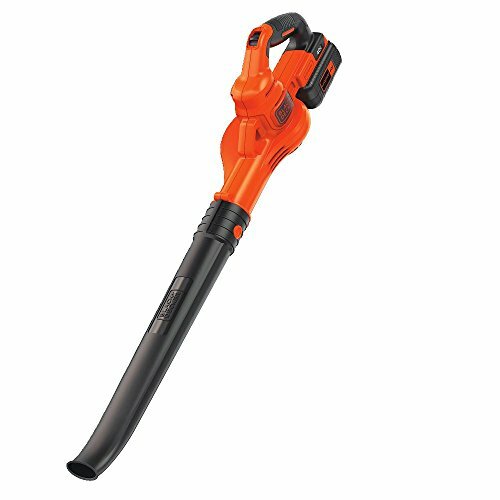 Additionally, some cordless leaf blowers have attachments that can make them even more useful, such as multiple blowing tube lengths, several attachable brushes, and so on. We also looked at the battery type, and determined easily that a lithium-ion battery is the best choice for many reasons. They last longer, up to six years, and they can generally be started by just squeezing the trigger. You only have to charge the battery and keep the blower tube clean with these types of leaf blowers. Finally, this type of battery power is quieter and lighter than other types. Should You Invest or Save Your Dollars? One thing many people wonder about cordless leaf blowers is whether it really makes sense to buy an expensive leaf blower or not. Higher-priced models generally include lithium-ion batteries, rather than nickel-cadmium batteries, but that’s not the only difference. Pricier models are usually lighter, and can be recharged faster. You may find that a more affordable option will be louder, and won’t come with as great of a warranty. However, if you don’t use your leaf blower very often, and all you want is to be able to walk around your yard a few times a year to get rid of the leaves, you may not need the extra features of a more expensive option. The price range of cordless leaf blowers usually ranges from $100 to $300, or more, with the high-end options like lithium-ion batteries adding around $80 at least to the price. If you want a cordless leaf blower that doesn’t require any special maintenance and is very quiet, it may be worth the additional investment. Also keep in mind that you can often buy the leaf blower only, without any battery included, for under $100, and then add the battery you want yourself. This may be a better option for someone that wants to be able to upgrade later on to a better quality battery. So which of these models is the best cordless leaf blower for you? Consider whether you need a lot of speed, a lot of run time, or just a basic leaf blower that will let you get your yard cleared up fast.